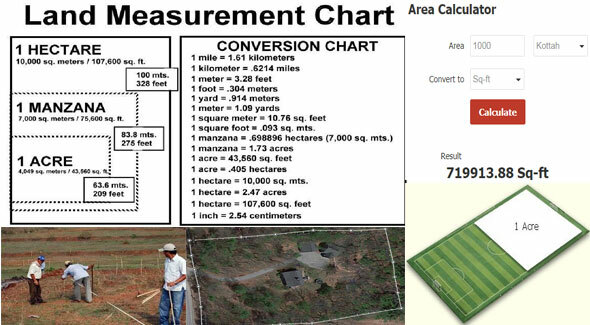 While measuring a land, a unit or set of units of area (square feet, square rods, acre etc.) are utilized. In the metric system, the most recognized unit of land area belongs to the hectare. A hectare is 10,000 square meters. Ten thousand square meters to a hectare is an intuitive quantity. One acre is similar to 0.4047 hectares (4,047 square metres). You can calculate the land with the help of online calculator. It is known as area conversion calculator. It is free to use. It can be used to work out in square foot, square yard, acres, guntha, biswa, bighas or square inch volume of any specified area, depending on total width and length. The tool provides you the corresponding values in all other land measurement units recongnized in India. How to use it: Just provide any value in the box specified below and click on the ‘Calculate’ button to obtain the corresponding values in all the other measurement units.